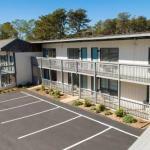 Free Wi-Fi an indoor pool and hot tub and perch near the Cape Cod National Seashore are highlights for guests at the Mainstay Motor Inn. The two-story Mainstay houses 29 rooms all of which feature free Wi-Fi cable TV work desks and clock radios. Some rooms include microwaves and mini-fridges and non-smoking accomodations can be requested. The spacious indoor swimming pool and hot tub mean swimming is an option no matter the weather. Parking is free. Pets are permitted. The Mainstay is off Highway 6 within an eight-minute drive of the Cape Cod National Seashore and Fox Island Marsh. Wellfleet Town Pier is three miles away. Provincetown Municipal Airport is 16 miles from the hotel and Boston's Logan International airport is 106 miles.